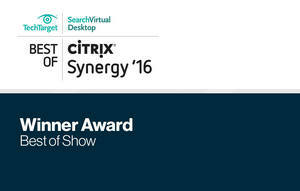 SEATTLE, WA--(Marketwired - Jun 1, 2016) - ExtraHop, the global leader in real-time wire data analytics for IT intelligence and business operations, today announced that the ExtraHop Discover Appliance with Ransomware Bundle won both the "Best of Show" and "Application, Data, and Network Security" categories in the Best of Citrix Synergy 2016 Awards, which took place at the Citrix Synergy 2016 event on May 24-26 in Las Vegas. A team of SearchVirtualDesktop.com editors, IT professionals, independent analysts, and consultants, evaluated exhibiting vendors and products based on innovation, value, performance, reliability, and ease of use. ExtraHop was awarded both honors based on its ability to quickly deploy and deliver value for customers. "We picked [the ExtraHop platform] as 'Best of Show' because, of the four winning products today, theirs was the one that could provide value immediately," said desktop virtualization expert and blogger Brian Madden. "It's not something you download, and then install or buy, and then ship and then build it, and then your environment is awesome...eventually. You can literally put the product in, push go, and get the benefits instantaneously. There were a lot of great products, but this was what earned ExtraHop 'Best of Show.'" "Ransomware is dangerous because it's very hard to detect until it's too late," said ExtraHop CEO Jesse Rothstein. "With our ransomware bundle, ExtraHop gives businesses the real-time analytics to not only proactively monitor for attacks, but also detect, track, and mitigate ransomware from the minute it infiltrates the environment. 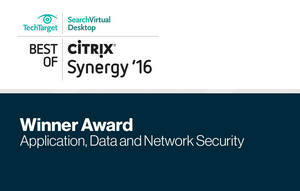 This recognition from the Best of Citrix Synergy judges validates our turnkey, differentiated approach, and ability to provide customers with immediate value." ExtraHop offers unmatched analysis of all data-in-flight -- client, network, application, and infrastructure activity. With ransomware attacks growing exponentially each year, this level of IT monitoring is imperative for businesses to proactively detect and track malicious behavior in real time, or identify and protect vulnerable resources before they can be compromised. To learn more about how ExtraHop helps organizations identify and thwart ransomware attacks, check out the case study, "Leading Health Services Provider Thwarts Ransomware Attack with ExtraHop," read the ransomware bundle datasheet, or view a two-minute online product demonstration. The ExtraHop platform has been honored numerous times by TechTarget judges in both the Best of Citrix Synergy and Best of Interop awards programs. 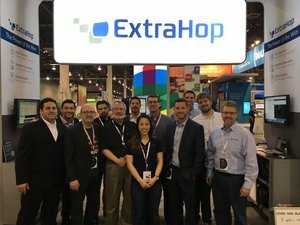 In 2016, ExtraHop was a Best of Interop finalist in two categories, including its second consecutive finalist nod in the Performance, Management, and Monitoring category. ExtraHop is also a past winner of Best of Interop Awards in the Cloud and Virtualization, Performance Management, and Best Start-up categories. ExtraHop is the global leader in real-time wire data analytics. The ExtraHop Operational Intelligence platform analyzes all L2-L7 communications, including full bidirectional transactional payloads. This innovative approach provides the correlated, cross-tier visibility essential for application performance, availability, and security in today's complex and dynamic IT environments. The winner of numerous awards from Interop, TechTarget, and others, the ExtraHop platform scales up to 40 Gbps in a single appliance, deploys without agents, and delivers tangible value immediately upon deployment. Learn what we mean at www.extrahop.com.